The fortunes of 1,165 candidates will be decided by 78 lakh voters in tomorrow’s elections to the 134-member Municipal Corporation of Delhi (MCD). According to the Delhi State Election Commission, more than 70,000 security personnel, including 40 companies of central paramilitary forces, would be deployed to ensure peaceful polling at the 9,447 booths. The Election Commission has identified at least 300 booths as ‘hyper-sensitive’ and another 1,000 as ‘sensitive.’ Already, about 1,300 people have been taken into preventive custody under various provisions. At least 10,000 polling teams will man the polling booths. Thirty-five Returning Officers (ROs) along with 134 Assistant ROs have also been deputed for the conduct of the polls, the Election Commission said. Thirty-five senior officers have been appointed as poll observers and another 35 as financial observers to keep a watch on the election expenditure, which is fixed at Rs 50,000 per candidate. The Congress has fielded its candidates in all the wards, while the Bharatiya Janata Party (BJP) has put up its nominees in 132 seats. A large chunk of 606 independents are also in the fray. During the campaigning, the Congress leaders, including Chief Minister Sheila Dikshit, ministers and legislators, had addressed over 5,000 meetings. Also campaigning for the party were Kamal Nath, Salman Khurshid, Begum Noor Bano and Uttaranchal leaders Harish Rawat and Satpal Maharaj. The BJP, on the other hand, roped in Vinod Khanna, actor Amar Upadhyay of ‘Kyunki Saas Bhi Kabhi Bahu Thi’ fame and former Miss World and actress Yukta Mookhey. It also brought in some of its central ministers, including Shahnawaz Hussain and Vijay Goel. The counting of votes will be taken up on March 27 at eight centres. Local issues, national implications. This is how the Congress views the Municipal Corporation of Delhi (MCD) elections. On the eve of the elections, an assertive Chief Minister Sheila Dikshit, flanked by All India Congress Committee (AICC) general secretary Kamal Nath and Delhi Pradesh Congress Committee (DPCC) president Subhash Chopra, said the outcome of the polls would have a ripple effect nationwide. The Congress, she said, would come to occupy the Town Hall with a thumping majority, signalling the beginning of the end of the Bharatiya Janata Party (BJP). Buoyed by the projections of a better performance in the MCD elections, Mr Kamal Nath said the BJP’s policies had been rejected “lock, stock and barrel” by the people who wanted to usher in change. “A bunch of contradictions” is how Mr Nath described the “artificial edifice” of the BJP-led government at the Centre. He said that the BJP had tried to prop up independents and others fearing a debacle in the civic polls and the ploy would fall flat on its face when the results come out. Dismissing allegations of the Government of NCT of Delhi not releasing funds on time to the MCD, Ms Dikshit said fiscal discipline was a must. “The BJP-ruled corporation cannot ask for funds without explaining where and how they have spent the money,” she said. Forty per cent of the funds, she added, had not been used by the corporation the past year. Weighed down by the anti-incumbency factor and the poor performance in the recent elections to state assembles, the Delhi unit of the Bharatiya Janata Party (BJP) was a little subdued in its claims on the eve of the MCD elections, a sharp contrast to the local Congress camp. Not that the party did not make any effort to retain its supremacy in the 134-seat corporation. It has done its share of pressing the flesh. Padyatras, shaking hands, early morning walkers’ greetings and roping in of cine stars and television artistes apparently did little than just add glamour to the otherwise lacklustre campaigning. The divisions within the BJP came to the fore even on the last day of the campaigning with the former Delhi Chief Minister and Outer Delhi MP, Mr Sahib Singh Verma, expressing his hopes for an impressive performance for the party only in his parliamentary constituency. Throughout the electioneering, the party was faced with the problem of managing its own high profile leaders, whether it was the former Chief Minister, Mr Madan Lal Khurana, Mr Sahib Singh Verma or the South Delhi MP, Mr Vijay Kumar Malhotra. 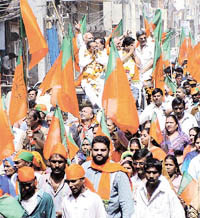 BJP sources said the party hopes to win around 40 municipal wards out of the 132 wards for which elections are being held. However, much would depend on the voter turnout. A comparative analysis of the previous polls in the Capital indicates that a low voter turnout has always favoured the BJP. The introduction of computer courses has proved a windfall for Maharshi Dayanand University. That is on paper. However, in actual practice, it eats away most of the university budget. The annual budget of the university for the coming financial year envisages an income of Rs 63.40 crore against the expenditure of Rs 65.96 crore. On the Plan side, the university plans to earn Rs 5.06 crore against the expenditure of Rs 19.16 crore. During the current financial year ending March 31, the university has unexpectedly earned over Rs 29.50 crore from the computer courses introduced by it in January 2001 against an anticipated income of Rs 14 crore. Only 5,646 students had got admission in these courses in 2001. However, during the current financial year, over 28,000 students had sought fresh and re-registration in the computer courses. The university proposes to earn an income of Rs 30 crore from the computer courses during the coming financial year, if the budget estimates are to be believed. It would, however, spend over Rs 18.82 crore in running these courses. This figure does not include the contingencies, expenses on staff, equipment, TA/DA etc. The university also proposes to earn Rs 6.75 lakh from University College in the shape of tuition fee, admission fee etc as per the budget estimates. But the income from the courses like CPEd, BIT and BiS has not been shown in the main budget neither in the Plan nor in the Non- Plan. University College has on its rolls nearly 380 students in the CPEd (certificate course in physical education) and the students have been charged Rs 25,000 each for the paid seat and Rs 15,000 for general seat. The university will earn Rs 9.12 crore from the examination fee, and the entrance examinations for admission to BEd and BPharm courses, re-evaluation fee, duplicate certificate fee and other entrance examinations. It will earn Rs 2 lakh from the sale of the answer books, waste papers etc. The university will get over Rs 3.91 crore from the fees and fines and Rs 25.75 lakh from the hostels for girls and boys. These are positives. On the negative side, the university would be losing nearly Rs 20 lakh in interest earnings on its deposits with banks following the lowering of interest rates by the banks. While the university plans to get an interest of Rs 80 lakh during the current financial year, it expects to earn only Rs 60 lakh in the coming year. The university expects grant-in-aid of Rs 15.55 crore from the state government under the Non-Plan and Rs 1 crore under the Plan expenditure. A provision of Rs 9.39 crore has been made in the budget for the ongoing works started during the current year. An amount of Rs 7.83 crore has been provided for new works which will be financed from the overall surplus funds of the university. When the going gets tough, the tough get going. This is how, Inspector Shyama Pant, additional Station House Officer (SHO) of the Shahdara police station, describes her role in the city’s police force. Daughter of a Delhi Police head constable and a Delhi University graduate, she joined the Delhi police in 1973 and since then has never looked back. Being a woman has never been an impediment in her functioning and this is borne out of the fact that she is perhaps among the very few women officers in the Delhi Police to be given the responsibility of a full-fledged police station and that too the one which till recently had the highest crime rate, due to its proximity to the adjoining state of Uttar Pradesh. Shyama Pant is credited to have saved the life of Rajesh Sharma, a cable operator of the area who had been kidnapped by some of his rivals and was being whisked away to some place in Uttar Pradesh last year. Gagged and bound, the suspects had thrown the victim into a Maruti van. As chance would have it, the alert police officer thought something was amiss when she heard a feeble cry from the van while waiting at an intersection in the area. Accompanied by a Head Constable, Jayveer and Constable Ridku, the lady police officer chased the van for several kilometres through heavy traffic and finally managed to intercept it near the border. The suspects were overpowered and the victim rescued. Apart from that, Shyama has been able to provide some succour to the women harassed by the in-laws for dowry by counselling both the parties and at times even cajoling them to end the rancour for the sake of the children. Her seven-year stint in the women’s cell of the Delhi Police and nine years in the Welfare Centre of the Delhi Police have honed her counselling skills. “Half of the crime incidents can be prevented by proper counselling,” the woman SHO strongly believes. Such is her reputation that a large number of her colleagues both at the police station and other areas call her up regularly to discuss varied problems with her. “Her advice is always good,” says a constable of the Shahdara police station who pleaded for anonymity lest the lady inspector should think that he was trying to curry favour with her. Over the years, Inspector Shyama Pant has participated in raids, helped in quelling riots and taken up crucial investigations shoulder to shoulder with her male colleagues and earned their respect by her professional approach. Ms Shyama says that being a woman has a lot of advantages in the police work and feels that a lot more woman should come and join the force as this would have a soothing effect on disturbed persons who generally turn to violence and crime. Her role model, of course, is the Magasasay award winner and the first woman Indian Police Service officer, Kiran Bedi, now a joint commissioner with the Delhi Police. Next to Kiran Bedi, it is her father, Head Constable Hari Datt Pandey, who always encouraged her and set an example of working honestly and sincerely. Married, she lives in Khajuri with her two sons and husband who works in VSNL. Does she have any regrets? None whatsoever, is the prompt reply. The State Consumer Protection Forum has ordered the Ghaziabad Development Authority (GDA) not to increase the prices of the residential flats allotted by it to the applicants under the Indirapuram Residential Scheme. Setting aside the GDA’s appeal to increase the prices of these flats, the forum has directed the GDA to allot the flats at the original price. The forum has also ordered the Vice-Chairperson of the GDA to institute an inquiry against guilty officials and pay Rs 3,000 to each of the victimised allottee as the cost of the plaint. This money should be collected from the salaries of the guilty officials, the order says. Mr Verinder Singh Chauhan, representing the allottees, had submitted before the forum that on a proposal by the GDA in 1994, officers and employees of the Income Tax Department had agreed to buy the residential flats built by the authority in 1989-90 in the Indirapuram Residential Scheme at the cost prices which it had incurred on the construction of flats. The GDA had sent a letter in connection with LIG flats on March 8, 1996 which fixed the price of the ground floor flat at Rs 1.89 lakh, first floor flat at Rs 2.54 lakh and second floor flat at Rs 1.95 lakh. Seventy-two employees had deposited the money as mentioned in the GDA letter. However, after the applicants were handed over the possession of flats on February 22, 1997, the GDA sent a letter to the employees union in which the prices of the flats were increased. At this, the allottees filed a suit in the District Consumer Protection Forum. Mr S. P. Tyagi, Chairman of the forum, had given a decision in favour of the allottees. But instead of honouring the district forum’s decision, the GDA went in appeal to the State Consumer Forum, Lucknow, challenging the district forum’s decision. The State Consumer Protection Forum, which has now ordered that GDA must give the houses to the allottees on the originally agreed prices, has virtually upheld the verdict of the Ghaziabad District Consumer Forum on the subject. The Delhi Sikh Gurdwara Management Committee (DSGMC) president and other office-bearers were released on bail today by a Delhi court after they appeared in person in a case relating to the procession taken out on the occasion of the martyrdom day of Guru Tegh Bahadur in December. The court had issued non-bailable warrants on a complaint lodged by the law enforcing authority that the DSGMC office-bearers did not cooperate with the Delhi Police on the Gurpurb day. Metropolitan Magistrate A. K. Sarpal granted bail to the DSGMC president, Mr Avtar Singh Hit, general secretary, Mr Kulmohan Singh, junior vice-president, Mr Shamsher Singh Sandhu, chairman of Dharam Parchar Committee, Jethedar Inderpal Singh Khalsa, and member, Mr Mangal Singh. The case would come up for hearing again on April 18. The police had filed the complaint on the grounds that the DSGMC members had protested their action and violated the orders. The issue of External Development Charge (EDC) in general and the fast industrialisation of Gurgaon overshadowed all other issues in a conference on ‘Destination: Haryana’ organised here today by the Confederation of Indian Industry (CII). Facing widespread outrage from member participants from the industries on the imposition of EDC, the Haryana Government announced the extension of the deadline of March 31 for depositing the first instalment by another three months. The top bureaucrats of the state led by the Chief Secretary, Mr L. M. Goyal, assuaged the industry’s feelings saying that the government was reviewing the rate of Rs 40 per square metre on the industrial plots imposed by the HSIDC. It is said that when the gods left their footprints on the land of Haridwar, they also left an indelible mark on the spiritual ethos of the people of the country. Haridwar stands as the gateway to the four pilgrimages of Garhwal. Mentioned as Mayapuri, Gangadwar, Mokshadwar in the ancient scriptures and epics, Haridwar has always remained as a major Shaktipeeth for the devotees. Of such significance is Haridwar in the thought of India’s traditional Hindus that it has earned the sobriquet, “The gateway to the gods”. Legend has it that the Ganga, the holiest of all rivers, which flows through this sacred city has actually been sanctified by the powerful trinity of Hindu mythology and the centre of the pantheon—Lord Brahma, Vishnu and Mahesh. Down the ages, this special importance of Haridwar as the ever-refreshing mystic venue for the purification of the mind, body and soul gained more impetus...and today manifests in two great events that take place here. The Kumbh Mela which happens once every 12 years and the Ardh Kumbh Mela, which comes once every six years. Yet, beyond the mystic aura and mythology, Haridwar casts another magic spell on the visitor. Being one of the oldest living cities, Haridwar finds mention in the ancient Hindu scriptures as it weaves through the life and time stretching from the period of Buddha to the more recent British advent. Haridwar is one of the first towns where Ganga emerges from the mountains to touch the plains. And that’s why the water is crystal clear and cool. Lush green forests and small ponds add to the scenic beauty of this holy land. The Rajaji National Park is just 10 km from Haridwar. It’s an ideal destination for wildlife and adventure lovers. In the evening the ghats look breathtakingly beautiful, as thousands of diyas (earthen lamps) and marigold flowers float and illuminate the holy waters. The temple of Chandi Devi atop the Neel Parvat on the other bank of river Ganga was constructed in AD 1929 by the king of Kashmir-Suchat Singh. It is a 3-km trek from Chandighat. Legend has it that the army chief Chanda-Munda of a local demon King Shumbh-Nishumbha was killed by goddess Chandi here after which the place got the name Chandi Devi. It is believed that the main statue was established by the Adi Shankaracharya in 8th century. This is an ancient temple of Maya Devi, the Adhisthatri deity of Haridwar, known as one of the Siddhapeethas. Said to be the place where the heart and navel of goddess Sati had fallen. This sacred ghat was constructed by King Vikramaditya in the memory of his brother Bhartrihari. It is believed that Bhartrihari eventually came to Haridwar to meditate on the banks of holy Ganga. When he died, his brother constructed a ghat in his name which later came to be known as Har-ki-Pauri. This sacred bathing ghat is also known as Brahmakund. The reflection of golden hues of floral diyas in the river Ganga is the most enchanting sight in the twilight during the Ganga Arti ceremony. It is situated on the Haridwar-Jwalapur bypass road. It is known for an old institution known for following a unique system of education in India. The Ved Mandir Museum with archaeological exhibits in display can also be seen. The temple of Goddess Mansa Devi is situated at the top of Bilwa Parvat. Here, one statue of the goddess has three mouths and five arms while the other statue has eight arms. The temple, which can be reached by a ropeway or on foot, affords a beautiful vision of the city of Haridwar. The ancient temple of Daksha Mahadev is situated in the South Kankhal town. The mythological story about this place is that king Daksha Prajapati, father of Sati (Lord Shiva’s first wife) performed yagya at this place. Daksha Prajapati did not invite Lord Shiva and Sati felt insulted. Therefore she burnt herself in the yagya kund. This incident provoked the disciples and followers Mahadev who killed King Daksha, but later on, Lord Mahadev brought him back to life. Daksha Mahadev temple is thus a tribute to this legend. During the winter season, fascinating birds, especially the Siberian Crane can be seen around Laljiwala on the banks of the river Ganga. The working of Haryana bureaucracy was exposed today when the separate inquiries by the Sub Divisional Magistrate and Gurgaon Divisional Commissioner in the same case came out with different conclusions. The investigation pertained to the alleged allocation of grant to wrong beneficiaries under the Indira Awas Yojna by the Block Development Officer and his staff. While chairing the monthly meeting of the District Grievances Redressal Committee here today, the Haryana Chief Minister, Mr Om Prakash Chautala, suspended the Block Development Officer, Junior Engineer and Gram Secretary of Rithoda village in Nuh following the report of the Gurgaon Divisional Commissioner, Mr L. S. M. Salins. Around six months ago, Mr Hemraj of Rithoda had complained to the Grievances Committee that the officers concerned had wrongly granted the financial help to eight persons under the Indira Housing Scheme. The State Health Minister, Dr M. L. Ranga, then directed the Sub Divisional Magistrate, Mr R. S. Kharab, to inquiry into the matter. Mr Kharab investigated the matter and reported at the committee that out of eight beneficiaries, four were legally right whereas the other four were wrongly benefited. Not satisfied with the report, Mr Hemraj again approached the Grievances Committee which was then chaired by the Chief Minister. The CM ordered an inquiry by the Gurgaon Divisional Commissioner, Mr Salins, again last month. He submitted the report today mentioning that only one person was entitled for the grant and in six cases, the beneficiaries were illegally benefited. On the basis of the report, Mr Chautala suspended these officials. The Chief Minister expressed his anguish at the siphoning off the people’s money in such a manner. The residents of several residential colonies in the Capital are up in arms against marriages taking place in the parks of the colonies, which apart from destroying the beauty of the parks, contribute to noise pollution. Last week, a resident of Press Enclave, situated just across the road from Malviya Nagar, protested against the loud music playing late at night at one marriage pandal. The result was that he was manhandled and beaten up. Mr Ved Kumar, a representative of the Senior Citizens Welfare Association (SCWA) of Saket, mentioned another problem that gives residents sleepless nights. “They (the guests at the marriages) park their cars inside the colony and drink there since they cannot drink inside the marriage venue. It is disgusting to see people drinking in cars and making noise outside your homes,” said Mr Kumar, who lives just next to the main park of Saket, where all the marriages are held. The day after the marriage is all the more difficult, as the MCD would not clean up the mess in the morning, residents said. Mr Jeetender Kumar Kochar, member of the Standing Committee of the Municipal Corporation of Delhi (MCD), said that “90 per cent” of the weddings that took place in residential colonies did not have the required permission. “Half of them don’t even ask for permission. But it is very difficult to keep a track of all these marriages unless residents complain,” he said. However, he maintained that the parks were cleaned the very next morning if a marriage had taken place. If at all the residents complained, it would be very late at night when the music had become a nuisance to them, he pointed out. “Let’s be practical. Where can we get staff at midnight?” he asked. He said the only way to solve the problem was the residents must complain the minute they saw the tents being put up in the parks. “Or even more simpler is to just care for others,” he remarked. However, the residents alleged that it was the authorities that were responsible. They suspect that the authorities are in collusion with the people erecting shamianas and pandals in parks. In Lajpat Nagar, not only the parks but even the main roads are taken over for marriages at times causing major hardships for commuters. “Neither the MCD nor the cops do anything about it. Why is it so?” asked Mr Gulab Rai, secretary of the Lajpat Nagar II RWA. “So many times we have seen police officials standing outside these marriages, eating food. The junior MCD officials must be bribed as well,” alleged a resident of Lodhi Colony. The major reason for marriages being held in ornamental parks was that there were very few colonies that have community centres, said Mr V. P. Kaushik, president of the RWA of Lodhi Road Complex. “Though I am personally totally against the loud music and destruction of parks, everyone cannot afford to hold a marriage in a five star hotel,” he said. He felt that the government had not done enough to construct community centres in residential colonies of Delhi, which is why marriages were being held in colony parks. Science has brought men closer to one another; the ends of the earth have been woven together in intercommunication and interdependence. Now they are talking in terms of a global village. Even then, it is widely recognised that the ethical quality, which can transform this proximity into a fraternity of the human race still remains a dream. It is here the role of religion attains significance. It is here the existence of teachers and spiritual gurus attains some significance. We have in our country several gurus who have been stressing the importance of spirituality. There is no doubt they speak with different voices when it comes to the meaning of existence, the concept of God and salvation. Kerala has its share of spiritual teachers, prominent among them being Mata Amritanandamayi. The Narayanaguru of Sivagiri ashram and his teachings are well known. Perhaps not so well known is Karunakaraguru, whose Shanitgiri ashram, has now extended its influence to the national capital. The foundation stone of its branch in Delhi in a plot of land near Pushpa Vihar, allotted by the government, was inaugurated recently. The Rs 2 crore project is certainly of some significance but did not get truly noticed in the public eye because of a number of events: President Narayanan who was scheduled to lay the foundation stone of the project could not come because of ill health; and for newspapers, it was a very busy day following the shocking death of the then speaker Balayogi in a helicopter accident. It was a well attended function at which were present the Lt-Governor Vijy Kapoor, Chief Minister Sheila Dikshit, former speaker of the Kerala Assembly Varkala Radhakrishnan, Swami Jyotirmaya Jnana Tapaswi, general secretary of the ashram and prominent members of the ashram. Several other religious leaders like Maulana Mohiduddin Khan , Yuva Acharya Amarendra Muni and the head of the Mata Amritanandamayi ashram here also graced the occasion and extended their good wishes. The Delhi project will have a prayer hall, centres for ayurveda and siddha systems of medicine, an information and counselling centre. The three storeyed structure to come up on the plot of land will conform Kerala’s traditional architectural standards. Santhigiri ashram was founded in 1966. In the 36 years of its existence, the ashram has set up its branches in several parts of Kerala and elsewhere. Like the modern day spiritual teachers, Karunakara guru, has been emphasising the social aspects of religion. In keeping with his vision, the ashram aims at revitalisation of life in its spiritual, social, economic and cultural aspects. Thus, the Delhi project has provision for a prayer hall, and centres for Ayurvedic and Siddha systems of healing. It was Gandhiji who said that for a poor man, God comes in the form of bread. The Santhigiri ashram has paid attention to this fact by paying attention to the physical needs of man. Karunakara Guru, started his ashram in a tiny hut donated to him by a benevolent admirer near Sivagiri. The guru’s ``grace, simplicity, infinite mercy, dedication and hard work’’ began to draw people of all castes, creed and religion . He also had to face much opposition and protests. He later shifted his “Santhigiri Ashram’’ to the present location at Pothencode. Today the activities of the ashram extends to different functional units in various fields of industry, agriculture, education, social welfare , commerce, art and culture, science and technology, women and youth development . However, the main thrust is on spiritual enlightenment and service to the poor and care of the ailing. The ashram offers food to all those who visit the place everyday. People suffering from various diseases used to come to the Guru for relief. In addition to prayer and austerities, he used to dispense ayurveda and siddha medicines. Began in this simple manner, today has a vaidyasala manufacturing and marketing nearly 400 drugs which have gained public acceptance. The ashram has nurtured a herbal garden which caters to the needs of the pharmaceutical unit. The herbal garden has several rare species of herbs. There is also a group of hospitals and panchakarma centres, which make use of drugs prepared at the ashram. The ashram runs a diary unit with 100 cows, a handloom weaving centre, a curry powder manufacturing unit and a production unit for making herbal soaps and cosmetics. About 200 families benefit from its cooperative coir unit; many women find shelter at its working women’s hostel in Ernakulam and the ideology of the guru is propagated through the ashram’s publications printed at its printing press. In all these ways, the Guru has provided a pattern of good community living and self help. It is here perhaps the usefulness of religion as a tool to improve living conditions for the downtrodden is best established. Karunakara guru began as an inmate of the advaita ashram at Aluva and later shifted to Sivagiri ashram set up by Narayana guru. But it was from a sufi mystic, Qureshi Fakir, received spiritual guidance. He never performed miracles but several people claim that they have been cured of their chronic ailments. There are other mysterious claims about him. He entered eternal rest on May 6,1999. Shia Muslims will take out a Tazia procession on the occasion of Moharram on the night of March 24. The procession will start from Bara Hindu Rao and will go through Pahari Dhiraj, Sadar Bazar, Chowk Qutab Road, Lal Kuan, Hauz Quazi, Chawari Bazaar and will culminate at Jama Masjid in the early morning. The procession will begin at 10 pm. Tazia procession will also be taken out in East, North-East, North-West, South and West districts and these will terminate at local “karbala” of the respective districts. The Northern Railways has announced some changes in the reservation timings on the occasion of Holi on March 29. The reservation offices at Sarojini Nagar, Lajpat Nagar, Okhla, Karkardooma, Noida, Delhi-Shahdara, Ghaziabad, Naya Azadpur, Subzi Mandi, Kirti Nagar, Tughlakabad and the Indira Gandhi International Airport will remain closed during the morning hours from 8 am to 2 pm. However, a skeleton service will be available at reservations offices in other places like IRCA, Delhi Junction (Old Delhi), Hazrat Nizamuddin etc. The reservations offices at Parliament House, Press Club of India, Supreme Court, Delhi University, International Tourist Bureau, Jawaharlal Nehru University and Delhi Tourism Development Corporation will remain closed for the whole day, an official release of the Northern Railways said today. The current reservation counters at New Delhi and Hazrat Nizamuddin stations will function as usual. The district police today arrested two youths and seized stolen goods worth Rs 15,500 from them. Besides, a Maruti car was also recovered by the police which was stolen from J P Colony here on March 21. The Sampla police arrested Indrajeet, a resident of Naunand village who had allegedly broken into the house of Krishan of the same village and took away jewellery, LPG cylinder, tape recorder etc. In a separate incident, the Maruti car of Mr Manjit Singh of Sirsa, who came here to attend a marriage on March 21, was stolen. Later, the local police traced the stolen car and identified the thieves. A cyclist was injured seriously when a Haryana Roadways bus hit him from behind on the national highway No. 10 here today. The injured person, Ishwar Singh, a resident of Jakhoda village, working in Somani factory was going to the factory on a bicycle when the incident occurred. He was rushed to the civil hospital in Bahadurgarh where his condition is said to be out of danger. The acquittal of five persons arrested on charges dacoity about four years ago, is a clear example that the police have often been unable to prove their case in the court primarily due to the lack of proper investigation and an over enthusiasm to take hasty action against innocent persons. A fast track court here ordered the acquittal of five youths, Kamlesh, Vipin, Munna, Rajesh and Ganesh, on Friday in absence of the required proof against them. The police had booked them for planning a dacoity in 1998 and had claimed to have recovered knives and sticks. But the police failed to provide evidence in the court and as a result, they were acquitted by the court after a trial of about four years. It’s a clear case of improper investigation. New Delhi: In a shocking incident, a six-year-old girl was crushed to death by a speeding truck in the Naraina area on Friday night. The victim, Sabia, resident of Lona Jhuggi, was playing outside when the speeding Tata truck (DL-1LB-0014) crushed her to death. The driver immediately abandoned the vehicle and fled the spot. The police have launched efforts to trace the driver and registered a case of causing death due to rash and negligent driving. Criminals arrested: With the arrest of three dreaded criminals, the North-East district police today claimed to have solved the murder another criminal on March 3 in the Nand Nagari area, thought to be their associate. The arrested criminals had participated with the deceased Puneet Gupta in two robbery cases along with a case of attempted murder. Dispute over sharing of booty between them became the reason for the arrested trio to murder Puneet Gupta in an abandoned brickfield after consuming alcohol. Five burnt: Five workers in an Aluminium die casting unit in Anand Parbat area received severe burn injuries on their face, chest and arms due to the leakage in gas pipe. The victims, Jeevan Thapa (28), Ram Vyas (27), Naresh (25), Virender (22) and Tapan (23) were admitted to the Jeevan Hospital in a serious condition. Sarai Rohilla police have registered a case in this connection. Liquor Seized: On the eve of MCD elections in the Capital, the Delhi police in its ongoing drive seized seven cars including Open Astra, Zen, Esteem, and an Indica which were ferrying 82 litres of liquor in 2800 pouches, 1396 bottles, 240 halves and 671 quarters. The drivers of the cars had been arrested and are being questioned.